In the early 1900’s, the goal of standardizing underground storage tanks that held flammable and combustible liquids was embraced by the early gasoline station tank owners, tank manufacturers, local fire officials and insurers in the U.S. Over the years, a variety of tank materials and standards were developed and safety procedures were tested. Local fire departments, always concerned about the storage of highly flammable substances, were important early safety experts on tank installation, and frequently required tank installation permits or inspections of underground storage tanks, a role that they still commonly perform. A more complete discussion of the history of storage tank systems is provided in Geyer and Wisuri (2000). 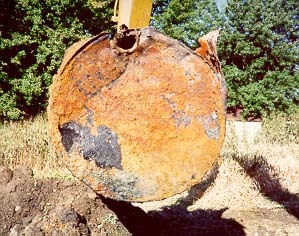 Although the placing of fuel hydrocarbons in buried tanks provided an elegant technical solution to the flammability concerns and space limitations for fuel storage at gasoline service stations, the unintended consequence of underground storage of hazardous chemicals was the high potential for surface spillage or tank or pipe leakage of the fuel hydrocarbons into the soil and groundwater. Until the mid-1980s most underground storage tanks (USTs) were made of single walled, bare steel, which is likely to corrode over time and allow the hazardous UST contents to leak into the subsurface. The greatest potential hazard from a leaking UST is that its contents, such as petroleum hydrocarbons or other hazardous substances, can seep into the soil and contaminate groundwater and thereby impact the source of drinking water which is sourced from groundwater for nearly half of all Americans. The Resource Conservation and Recovery Act (RCRA), which amended the Solid Waste Disposal Act of 1965, set national goals governing the disposal of solid and hazardous waste. RCRA Subtitle I regulates underground storage tanks containing hazardous substances. To address a nationwide problem of leaking USTs, Congress passed a series of laws starting in the mid-1980s to protect human health and the environment. Tank regulations started in 1984 with the Solid Waste Disposal Act (SWDA) and Subtitle I were added to the act through the Hazardous and Solid Waste Amendments. This legislation created a federal program to regulate USTs containing petroleum and hazardous chemicals and to limit corrosion and structural defects and thus minimize future tank leaks. The act directed EPA to set operating requirements and technical standards for tank design and installation, leak detection, spill and overfill control, corrective action, and tank closure. Two years later, in 1986, Subtitle I was amended through the Superfund Amendments Reauthorization Act (SARA) to authorize the EPA to respond to petroleum spills and leaks and to direct EPA to establish financial responsibility requirements for UST owners and operators to cover the cost of taking corrective actions and to compensate third parties for injury and property damage caused by leaking tanks, creating a Leaking Underground Storage Tank (LUST) Trust Fund. The LUST Fund is used to oversee cleanups by responsible parties, enforce cleanups by recalcitrant parties, and pay for cleanups at sites where the owner or operator is unknown, unwilling, or unable to respond, or where emergency action is required. In California, the Barry Keene Underground Storage Tank Cleanup Trust Fund Act of 1989 created the Underground Storage Tank (UST) Cleanup Fund (Fund) to help eligible owners and operators of petroleum USTs. The Fund helped these entities to meet federal and state requirements to demonstrate financial responsibility, provided financial assistance by reimbursing costs of cleanup and provided reimbursement for damages awarded to third parties who are injured by unauthorized releases of petroleum from USTs. It was almost two decades later before additional Federal UST legislation was passed. The Energy Policy Act of 2005 amended Subtitle I of the SWDA and added new leak detection and enforcement provisions to the program. The act also required that all regulated USTs be inspected every three years, expanded the use of the LUST Trust Fund, required EPA to develop grant guidelines regarding operator training, inspections, delivery prohibition, secondary containment, financial responsibility, public record, and state compliance reports on government USTs and required EPA to develop a strategy and publish a report regarding USTs in Indian Country. To date, the Fund is still in operation. What has changed, since 1989, is the increase in the understanding of the toxicity of the fuel components, the various exposure pathways and knowledge about risk and sensitive receptors. Over time, the cost for cleanup per site has increased, reflecting (in part) that the easier sites have already been closed, and that the remaining sites are ones with more challenging environmental conditions. In 2008, the Fund suffered reduced funding, increased costs and increasing regulatory requirements to close sites. To address this issue, the State Water Quality Control Board performed a complete evaluation of the UST program. The review of the UST program resulted in the Low-Threat Underground Storage Tank Case Closure Policy (LTCP), and associated SWRCB Resolutions and other associated legislation. The stated objective of the LTCP was to bring costs and efforts in line with the relative threat of the impacts. The objective of this website is to create an archive of relevant historic and current regulatory LTCP documents as well as public comments on those documents. The web site also offers a confidential survey that will provide LTCP researchers with a better understanding of the LTCP, its consequences and its future.